Cabo San Lucas is known as the "Marlin capital of the world" because the beautiful blue waters of the Baja Peninsula are teeming with copious populations of Striped, Black, and Blue Marlin. Why not book your Cabo fishing trip as soon as you arrive in town? There are plenty of other fish varieties that also inhabit the surrounding waters. Come on, what are you waiting for? You may even land that prize winning catch of a giant Mahi Mahi, Tuna, or Snapper as this is truly one awesome fishing spot. Obviously, the abundance of particular species depends on the season. It doesn’t matter what time of year you head out on a Cabo San Lucas fishing charter because there’s always plenty of fish to be caught. You can rest assured that you’ll be bringing home lots of fish regardless of when you go out on your Cabo fishing trip. With such fantastic fishing available, a Cabo San Lucas fishing charter offers a first-rate way to tackle the true Los Cabos fishing experience. Whether you are a proficient angler that’s in the know about fishing or a complete novice that’s never even cast a line before let alone caught a fish, there is something to suit everyone’s fishing needs with a Cabo San Lucas fishing charter. To insure availability of your charter boat, it is advisable to make reservations as far in advance as possible to avoid disappointment, as a Cabo fishing trip is extremely popular with both tourists as well as locals. Whether you’re cruising out in our 70' Cabo deep sea fishing charter boat or zipping along the waters in our 24' fly fishing sportster, one thing’s for certain, the fish will be biting! No matter how many keen anglers are coming along for the Cabo fishing trip of a lifetime, we have the right boat to suit your party’s needs. 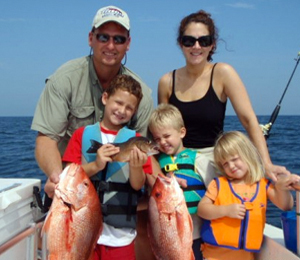 Taking the family out for their very first fishing experience? You won’t be able to wipe the smiles off their faces whether they catch just a teeny fish or a big one. Bigger fish may make for bigger smiles though! The friendly crew and deckhands onboard your Cabo San Lucas fishing charter will happily assist them with bating hooks and other fishing knowhow to help them get the most out of their day. Better still, with the kids being helped that means more fishing time for you. Don’t forget that you will need to purchase a fishing license before heading out on your Cabo fishing trip. These are easy to acquire as you can buy them at the marina for $12/day or $25/week. Then it’s off into the wild blue yonder for some serious fishing Cabo San Lucas fishing charter style. Don’t forget your hat and sunscreen.